Q.) What does a poetry blogger give an internet audience who has everything? A.) Thirty stanzas of Yankee Doodle, of course! Below, (courtesy of “The Oxford Book of American Light Verse” 1979) is a fairly complete version of this old satirical ditty. Other stanzas, along with the song’s history, have been lost to the ravages of time. Scholars continue to dispute Yankee Doodle’s origins. The catchy tune is thought to be derived from an old folk song. The stanzas below are traceable as far back as the Seven Year’s War. 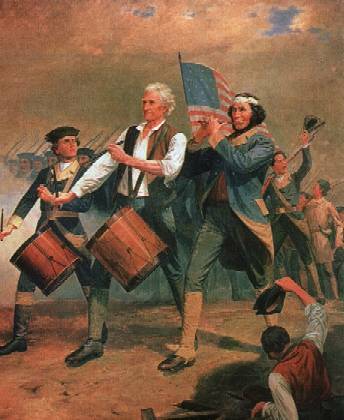 Yankee Doodle was sung by the British to mock the Americans, who then appropriated it and rewrote the lyrics in the spirit of turnabout. The rest is history . . . . They eat it when they’ve mind to. They looked so tearing fine, ah! To fight for the nation. And that’s a Yankee’s supper. Is Cape Breton is taken. And make the some some wider. We’ll go to Mother Chase’s. Pumpkin pie is very good. You’d not have been so wanton. As big as Daddy’s hog trough. He tore out all the stitches. Dolly Bushel let a fart. Where Doctor Warren ground it. And bring her tail behind her. Lie one atop the other.